Leisure facilities 0.25 miles away with pool, sauna etc. Children welcome from any age. 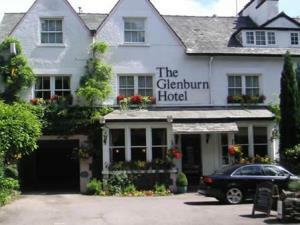 The Glenburn Hotel & Restaurant sometimes limits bookings to 3 or more days. Standard double or twin en suite with tea/coffee facilities and TV, recently refurbished. These prices are per night Bed and Breakfast. Please contact the Hotel for Dinner Bed and Breakfast Rates. A £50 deposit is required to confirm your booking, the hotel owner will contact you within 48hrs. Twin en-suite sometimes limits bookings to 3 or more days. From M6 jct 36 follow A591 to Windermere. turn left into village and travel past shops towards Bowness and the lake, the hotel is found on the left hand side 800 yds from village. Hotel ideally located just s short walk to the centre of Windermere. Staff very helpful and friendly. Room very clean and quiet. Great breakfast!